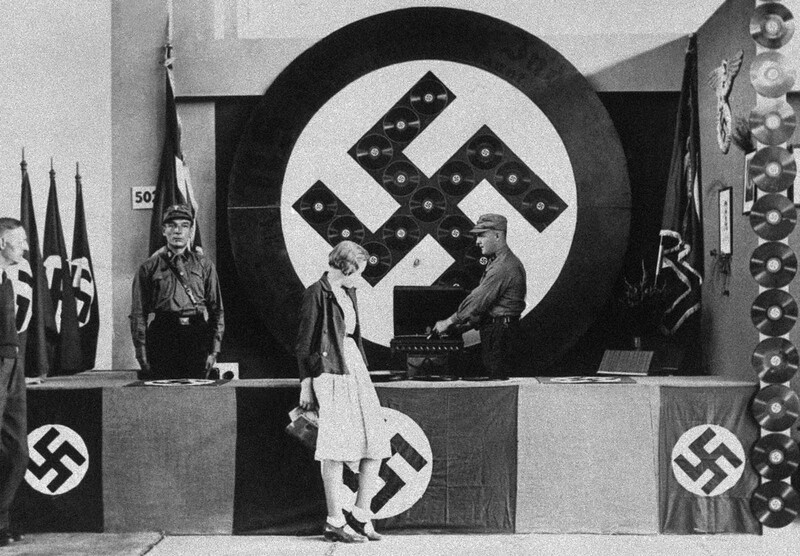 The booth was designed as propaganda of the Nazi gramophone plate industry. Propaganda was an essential tool of the Nazi movement. They understood the power of emerging technologies, such as films, radio, and television, to disseminate their message into homes and workplaces. The gramophone was a key piece of this propaganda. With it, Nazis were able to play key speeches on the streets of Germany using loudspeakers mounted on trucks. They were also used in homes and local meetings to advance the agenda. Later when Nazis came to power, Goebbels’ Ministry of Propaganda encouraged the production of home listening devices at affordable prices. Mein Kampf contains the blueprint of later Nazi propaganda efforts. A”Propaganda must always address itself to the broad masses of the people. (…) All propaganda must be presented in a popular form and must fix its intellectual level so as not to be above the heads of the least intellectual of those to whom it is directed. (…) The art of propaganda consists precisely in being able to awaken the imagination of the public through an appeal to their feelings, in finding the appropriate psychological form that will arrest the attention and appeal to the hearts of the national masses. The broad masses of the people are not made up of diplomats or professors of public jurisprudence nor simply of persons who are able to form reasoned judgment in given cases, but a vacillating crowd of human children who are constantly wavering between one idea and another. (…) The great majority of a nation is so feminine in its character and outlook that its thought and conduct are ruled by sentiment rather than by sober reasoning. This sentiment, however, is not complex, but simple and consistent. It is not highly differentiated, but has only the negative and positive notions of love and hatred, right and wrong, truth and falsehood. DJ Final Solution in the haus! Very interesting what Hitler wrote there. I am easily able to identify his anti-jewish, anti-black and racist descriptions as total nonsense. But here about the topic of propaganda, I wonder how much he was right, and I would not be surprised if he was. Anyone can prove Hitler wrong or has additional thoughts? Maybe this is just the core of fascism. To spread anti-democratic thoughts and hatred between people in a believable way, using emotions instead of rational thinking. I would have to conclude that he was spot-on. The application of propaganda by Goebbels and Hitler, etc. were flawless in their use of iconography, color schemes, music and spectacle. Rumor has it they studied American advertising and modified for the German consumer.